Due to extremely high river levels and widespread flooding following Hurricane Matthew, the S.C. Department of Natural Resources (SCDNR) has declared temporary hunting closures on all game species (except alligators, doves, hogs and coyotes) within the Great Pee Dee and Little Pee Dee River drainage systems. The flooding has created potential for exploitation of game species that are deprived of their normal escape routes and are confined to small areas of high ground, and SCDNR has received concerns from multiple sportsmen. Marion County – All areas south of U.S. Highway 378 and bounded on the west side by the Great Pee Dee River and on the east side by the Little Pee Dee River. Horry County – West side boundary – beginning at U.S. Highway 378 at the Little Pee Dee River, thence south along the county line and Little Pee Dee River to the confluence of the Great Pee Dee River, thence southeast along the Great Pee Dee River to U.S. Highway 701. East side boundary – beginning at the Georgetown County line at the Great Pee Dee River on U.S. Highway 701, thence north on U.S. Highway 701 to State Road 24 (Pee Dee highway.) thence north on State Road 24 (Pee Dee highway.) to U.S. Highway 378, thence to the Little Pee Dee River. 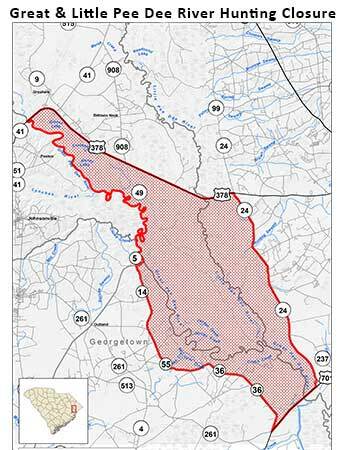 Georgetown County – West side boundary – beginning at the Great Pee Dee River at the Williamsburg County line, thence west along State Road 5 (County Line Road) to the intersection with Old Pee Dee Road (State Roads 14, 55, and 36), thence south and east along Old Pee Dee Road to the intersection with U.S. Highway 701. Eastside boundary – beginning at the intersection of State Road 36 (Old Pee Dee Road) and U.S. Highway 701, thence northeast to the Great Pee Dee River, thence northwest along the Great Pee Dee River to State Road 5 (County Line Road).